The Mackie CR4BTs, complete with Bluetooth logo on the front. Mackie has announced that it's adding to its range of CR Series 'Multimedia Monitor' speakers by releasing the CR4BT and CR5BT, which have the added advantage of Bluetooth compatibility. As such, you can play music through them wirelessly. "A common expectation of technology products these days is fewer wires, whether in a studio, entertainment system or other multimedia environment," commented Mackie Channel Marketing Director, Matt Redmon "In consideration of that evolving customer demand, the new CRBT models provide the same studio-quality design and acoustic performance as the other Creative Reference models, only now with the flexibility of streaming audio wirelessly in environments where high-quality sound is required." The new models join the CR3 and CR4 in the range, with the CR5BT offering a 5-inch woofer for added low-frequency response. Bluetooth pairing can be achieved by pressing the relevant button on the front panel, where there's also an additional Aux input. Each pair of Mackie CR Series monitors comes with acoustic isolation pads. 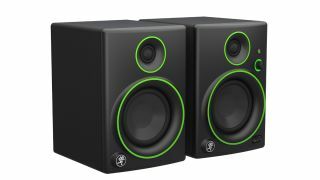 The CR4BT and CR5BT are both shopping now priced at $260 and $320 per pair respectively. Find out more on the Mackie website.